Within the context of changing climate and uncertain economic times, access to and availability of both store-bought and traditional food is decreasing in Yukon. Across the Canadian North, food security is becoming an increasingly urgent issue, and one that requires both immediate and long-term collaborative efforts towards realistic, culturally relevant and sustainable solutions. Communities across the North are focusing their attention on developing coordinated food security strategies and activities. Much work has already been done in this territory towards ending food insecurity, however there is still considerable work to do. 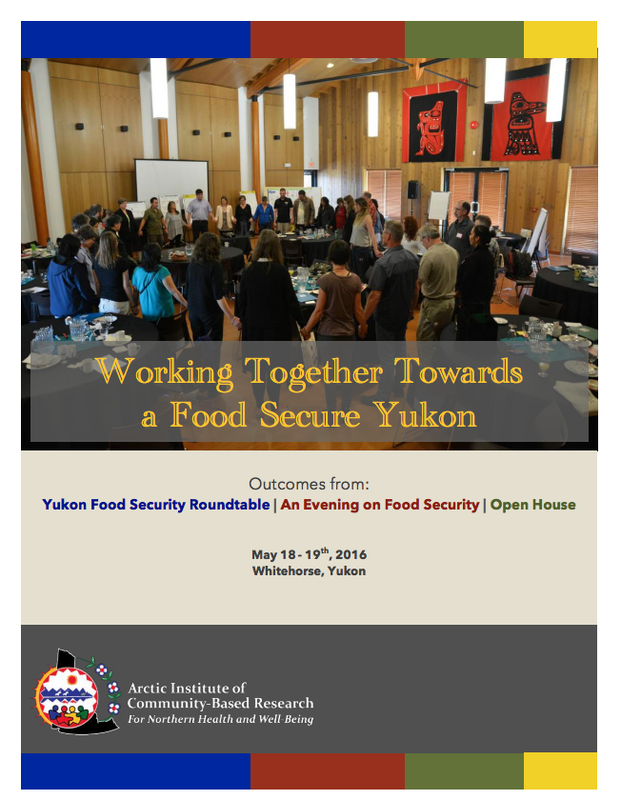 The Arctic Institute of Community-Based Research (AICBR) hosted three food security events May 18th - 19th, 2016: a Yukon Food Security Roundtable (YFSR), An Evening on Food Security, and a Food Security Open House. The Yukon Food Security Roundtable was an opportunity for delegates from multiple sectors across the territory to come together to share current food security-related activities, identify factors that limit or facilitate food access and availability for Yukon residents, and to prioritize next steps. The roundtable welcomed participation from 79 delegates from across the territory, including representation from 16 Yukon communities, Indigenous and non-Indigenous government and non-government officials, non-profit sector, academics, food producers, and concerned citizens, as well as federal government and non-government representatives. An Evening on Food Security was hosted with the support from the Pierre Elliott Trudeau Foundation. Four speakers from across Canada and Alaska shared their work related to food security. Speakers included Diana Bronson, Executive Director of Food Secure Canada, Anelyse Weiler and Sophia Murphy, Scholars, Pierre Elliott Trudeau Foundation, Dr. Joseph Leblanc, Executive Director of Social Planning Council Sudbury and member of Indigenous Circle of Food Secure Canada, and Kathleen Wayne, Manager Family Nutrition Programs, Alaska Department of Health and Social Services. On the final afternoon, AICBR opened up the Roundtable space to the public with an Open House. Here, members of the public were encouraged to share their voice and experiences on the topic of food security. The overall goal of hosting these three events is to raise awareness on food security in general, including current strengths and areas of further attention, and to bring people together from various sectors to work on developing actionable plans for moving towards a just and sustainable food system and food security for all Yukon residents. WE ALL NEED TO EAT AND WE ALL HAVE THE RIGHT TO HEALTHY FOOD CHOICES. THIS IS WHAT MAKES US AN INTEGRAL PART OF THE FOOD SYSTEM. "A sustainable community/regional food system is a collaborative network that integrates sustainable food production, processing, distribution, consumption and waste management to enhance the environmental, economic and social health of a particular place. It must be informed by community identified values and principles and requires people from all aspects of the system to work together now and in the future. As our climate changes, we have more to consider at every point in the system." To bring people together across various sectors to increase awareness about food insecurity issues, share current food security-related activities, identify factors that limit or facilitate food access and availability for Yukon residents, and strengthen existing food networks. To use results of Roundtable to feed into larger pan-Northern discussions. To contribute to a more comprehensive Northern picture of food security as part of the emerging National Food Policy that the federal Ministry of Agriculture and Agri-foods has been mandated to develop. We want to thank our generous funders and valued partners for making these events possible. Namely, the Public Health Agency of Canada's Innovation Strategy, the Government of Yukon's Community Development Fund (Department of Economic Development) and Health Investment Fund (Department of Health and Social Service), Air North, and the Pierre Elliott Trudeau Foundation's Scholars, Fellows and Mentors. Your support has helped us to bring people together to work towards ending food insecurity in Yukon! The Food and Agriculture Organization of the United Nations defines Food security as "when all people at all times have access to sufficient, safe, and nutritious food to maintain a healthy and active life." It includes both the physical and economic access to food that meets people's dietary and cultural needs and food preferences (source). Simply put, people have access to and can afford the good, nutritious food that they want to eat. Food insecurity is a lack of food security - people don't have access to affordable, acceptable, and adequate food to meet their daily needs and preferences. Food insecurity is serious public health problem because when individuals are food insecure they are not getting enough of the right nutrients to be able to lead a healthy, active life. The stress of not having enough food to feed yourself and your family deeply affects a person's wellbeing. When children grow up hungry they are more likely to experience poor health conditions later in life, particularly depression and asthma; adults living in food insecure households have higher rates of depression, diabetes and heart disease (source). Food security is linked to environmental, economic and social health of a particular place and the wellbeing of its people. When people are food insecure, they are less likely to be able to live a fulfilled, balanced and productive life. Long-term food insecurity not only affects the individual but affects the population as a whole. Food sovereignty is the “right of peoples, communities and [nations] to define their own agricultural, labour, fishing, food and land policies, which are ecologically, socially, spiritually, economically and culturally appropriate to their unique circumstances” (source). A food system has many parts. In general, the food system refers to the path food takes from the land to our stomachs. It includes everything from growing and harvesting, processing, transporting, storing, managing/marketing, paying for, eating and how we handle food scraps and packaging. What is going on in Yukon? 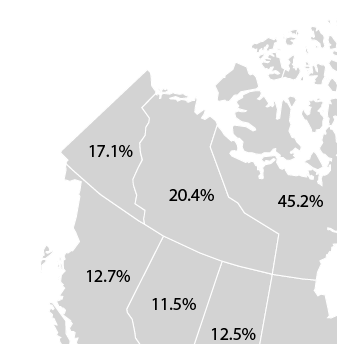 Food insecurity in Canada affects 4 million Canadians (source). The most recent available data from the Canadian Community Health Survey in 2012 showed that 17.1% of Yukon was food insecure, with 12.4% being either moderately or severely food insecure, meaning either the quality and/or quantity of food is lowered due to a lack of money for food (moderate) or household members are missing meals, reducing food intake and/or going day(s) without any food (severe) (source).